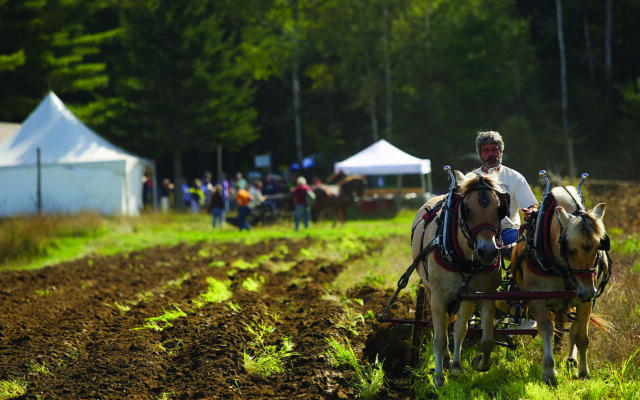 How the Common Ground Country Fair defines September in Maine. October through August, it lives on in posters and t-shirts donned with the images of a rural life — draft horses, canned dilly beans, a curly bunch of fresh garlic scapes. But just as the leaves start to change in September, these small reminders come to life when thousands of people flock to Unity for the Maine Organic Farmers and Gardeners Association’s signature event, the Common Ground Country Fair, a three day celebration of rural living. While it occurs annually only for a short weekend that straddles two seasons, the fair represents a much larger community that thrives in Maine 365 days a year. This year the fair will return September 22 through September 24 for its 41st year, for three days full of demonstrations, talks, farmers’ markets, artisan crafters, vendors, food and music, that taken together weave a canvas that illustrates the organic way of life that MOFGA has worked to foster in Maine. Over the last decade, the Common Ground Country Fair has drawn 60,000 people annually to the Unity-based fairgrounds, from not only Maine and New England, but nationwide. This immense following is a true testament to the founders of the fair, who 40 years ago worked tirelessly to pull the whole thing off — even when it didn’t look like they would. “In my mind’s eye I could see people at the fairground. I could see the cars coming in. I just knew, I knew, I knew in my gut that this was going to work, and I don’t think I’m the only one,” said Chaitanya York, the first Common Ground Fair Director. It sounds cliche to say that the fair getting its start happened organically, but it’s true, it was the culmination of several sources of inspiration and the collective power of an entire organization getting together to make something out of nothing. Around the mid-1970s MOFGA, the country’s oldest and largest organic agriculture organization, was looking for a way to fund itself. At the time, York and other MOFGA staff members were pondering whether an annual fair could gather a large enough following to provide a livelihood for the organization. Growing up in Maine with his grandparents, York, now 73, has fond memories of attending agricultural fairs like the Topsham Fair and being engrossed in the draft animal demonstrations and exhibition halls full of prized crops. This childhood experience was taken to a next level, when as executive director of MOFGA, he had the opportunity to attend an event at the University of Massachusetts that highlighted the latest in sustainable and renewable technology. York began to envision an event that took the best of traditional agricultural fairs and paired that with forward-thinking aspects such as alternative technology and sustainable agriculture. Once he shared this idea with other MOFGA members who took it to their respective county chapters, the idea of holding an annual fair to fund the organization become the property of everyone, and the Common Ground Fair as we now know it began to take shape. “It was a powerful and dynamic way to express the mission and the vision of the organization […] It’s just this holistic, comprehensive, all inclusive celebration of rural living,” York said. But conceptualizing the fair and pulling it off were two different things. York calls the people on the original fair steering committee in 1977 his heroes. Without them and their belief in this lofty idea, Common Ground would have never happened, York said. In trying to fund the first fair, York did not want to compromise the organization’s values to secure grants. But a few months before the fair was due to be held, York knew they needed more money to get the event off the ground. So he went to the staff and asked his MOFGA colleagues if they would be willing to go on half salary until the fair was held, after which they would be reimbursed. “I could just feel it in my bones that this was something that was going to work,” York said. And boy, he was right. That year MOGFA held the first Common Ground Country Fair on the fairgrounds in Litchfield, drawing 10,000 people. Within three years, York said the fair achieved the goal of funding the organization. It’s undeniable that Common Ground has grown exponentially in the 40 years since its debut. In 1996, the fair found its permanent home in Unity when MOFGA purchased 200 acres of land to house the fair and a year-round education center. Over the years the fair’s topic areas have grown to include more than 16 different sections at present standing. But at its heart, the fair feels much like it did in the beginning — like a welcoming ode to community. “In many ways the fair fulfills something that everyone is really looking for, that connection, either through like minded people, great talks about innovation, or great music. A lot of people are just looking for a place to connect, a place to be, a place to celebrate,” said current Common Ground Director April Boucher. By having something for everyone, Boucher says it doesn’t matter if you’re a first-time fair-goer or a long time patron, there’s bound to a be topic that makes you feel at home. This year over 750 demonstrations, talks and workshops are scheduled over the three days. From the animal barns, to the children’s area, to agricultural products and renewable energy, to every imaginable food option and not one but two farmers’ markets, the fair succeeds in touching every aspect of a sustainable and rural life. From its founding, Common Ground was meant to be not only a celebration of rural life, but an education in it. Bertin’s experience with the fair is the perfect example of this. First coming to the fair as a college student in the 1990s, he was mesmerized by the display of sustainable agriculture. But as he and his partner Sarah started and grew their organic horse-powered farm in Gouldsboro they went from novices showing up with a willingness to learn, to draft-horse demonstrators who seek to share what they’ve learned. “The fair to me, in lots of ways, besides for folks to buy things and eat lots of yummy food, is a chance where people are getting together to say, ‘This is what we know, does anybody want to know it?’ It just really is an open place for folks to share enthusiasm, to share the misery of the season’s woes, and then also share the knowledge that they have. Whether it’s the wonderful wisdom of the silver-haired folks who are there or the young folks who are trying,” Bertin said. Farmer Mark Guzzi, owner of Peacemeal Farm, said he’s too grown through the years with Common Ground. Attending his first fair in 1993 — the year of the beet poster, as he recalls — Guzzi was an apprentice working for someone else. Now in his sixteenth year selling produce at the fair’s market, Guzzi is the owner of a farm outright. “It is by far the best farmers’ market you can attend. There is a whole lot of everything. Which I think makes for a great experience for people who are coming to shop there,” Guzzi said. At his weekly farmers’ markets, like any farmer, Guzzi has regular customers. But even though Common Ground falls only once a year, the phenomenon of knowing what specific recurring customers are going to purchase still happens. Great relationships are forged on the fairgrounds, Guzzi said, and while those relationships might only be rekindled on that weekend in late September, they signify something much deeper — a community of people who share an appreciation for a rural life.